Texting My Pancreas: It Is What It Is. Some days, I'm super confident. Some days, I'm super NOT. Then comes a day that reminds me that I'm most certainly not. But I'm getting around to being perfectly okay with that. I make a lot of mistakes - but, I would bet that you do, too. Sensors fail; boluses (bolusi?) don't match up; fingers won't bleed. Food choices; exercise - never quite "right". My body behaves in ways that betray me - Stop shaking so hard; pull it together; I don't care if you're low and at work and feeling helpless - you're embarrassing me. It is what it is, and I can only do my best. And even when what I'm doing doesn't seem my best - it really is; right then. You know? I will take diabetes seriously, but not myself. I will refuse to let this consume me. Great post. I do love those days when we feel like our pancreas totally kicked in. Then of course there are the other days...ugh. Well said!!! Yes, I think I know. That's a good way to put it. "It really is." I have to tell myself that alot, for me it is when I've done (or thought) I've done everything right and I'm still high. My dr once told me "you're doing all the right things, diabetes doesn't always follow the rules". I'm of the mind set that if I follow the rules it should too. Nice graphs.. the both of them. I like them because they reflect the reality of this disease. Great post. Sometimes we all need that reminder. Justice calls his Dex shark teeth on days like that. I thought I was the only one!! I totally do that too, I think I MUST BE CURED! Then a horrible day rolls in and it's like THANKS!!! oh kim, i know the feeling. 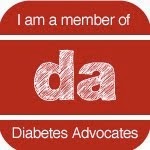 we are stronger than our diabetes, even when it doesn't feel like it. I thought I was the only one, too!! 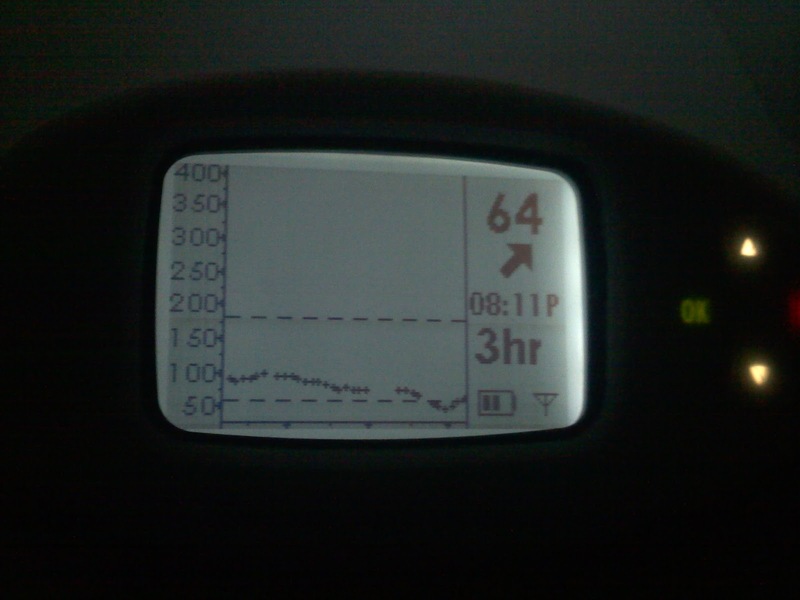 When I have a nice flattish line on my CGM for a day or two, I think I don't need insulin, and I can pig out on carbs because I don't really have diabetes! 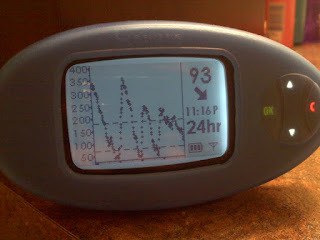 I even made myself a T-shirt with a picture of a good CGM day upside down, and the caption "It's the insulin, dummy!" also upside down, so *I* can look down and read it. I don't know why I get those totally irrational thoughts, but there they are! Thank you so much, Kim, and all of you, for doing this, for being here. To Polina, above, yes, the same with me, all of these blogs are coming up and being quite appealing lately. I feel like I've finally found the "Betes Buddies" I've been looking for for the past 18 years. Keep writing, all. 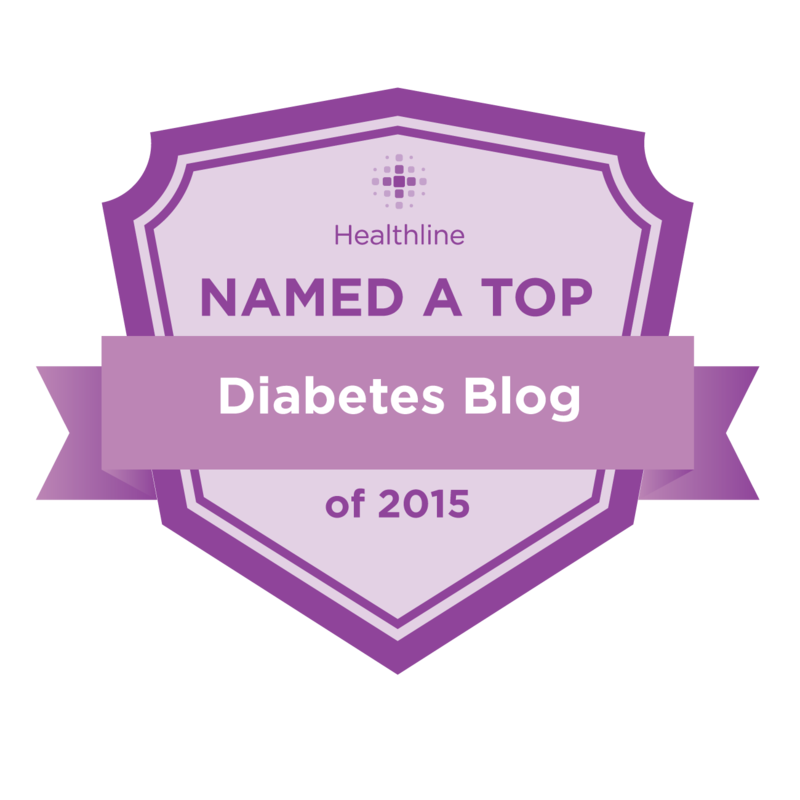 Diabetes blogs -- so much more valuable than BG logs! Sometimes, pictures paint it so well. Thanks for sharing, Kim. In all the Highs and Lows and rises and dips. Here's to good vibes of balanced out BGs for ya.